The Motor Market car magazine of 1953. Homepage. This page: Available on subscription for 25 shillings per year, a motor parts magazine from 1953. The Motor Market - April 1953. 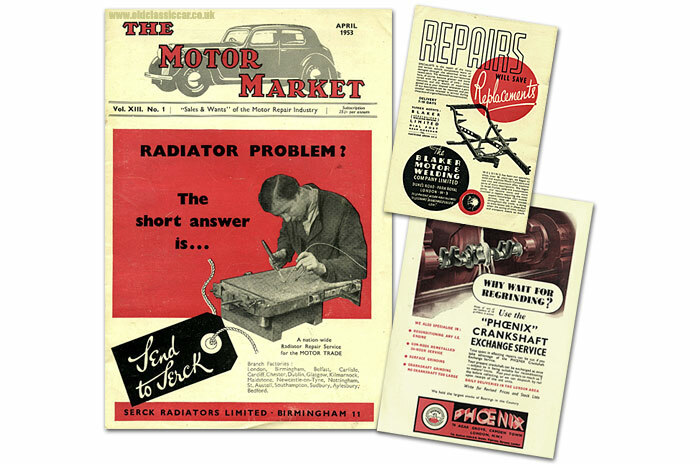 This A5-size magazine, The Motor Market, was available by annual subscription only, and positioned itself as the "Sales & Wants" of the Motor Repair Industry, suggesting that by and large it was aimed at Trade readers, rather than the general public. This issue dates to April 1953. The lead advertisement on the cover is for Serck Radiators Ltd, publicising their nationwide repair service (again to the Trade only). Flick to the back cover, and there is an ad for the Blaker Motor & Welding Company Ltd, Park Royal in London. 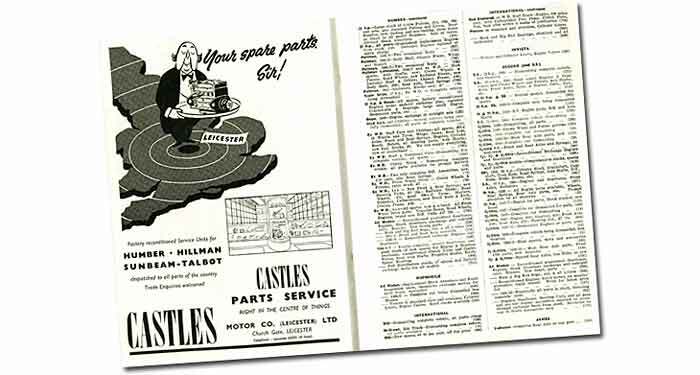 Despite the war having finished some 8 years earlier, it was still casting a shadow over motoring even then, as the text of the ad, highlighting the importance of repairing old cars during various demands on resources, makes clear. "Specialists in the repair of the many and various vehicle components worn or damaged through the abnormal stress of recent years. The demands on our resources have, of course, become greater and more varied with the progress of time; these resources and the wealth of experience gained are at your disposal whenever a part of any description can be repaired, and yet another vehicle retained in service during these days of urgent National Reconstruction." 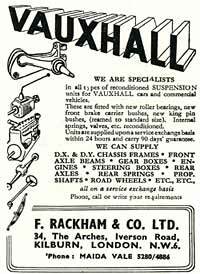 Inside the front cover is a full page ad for the Phoenix crankshaft exchange service, with an illustration of a crank being reground on one of their 18 grinding machines. The majority of The Motor Market magazine is given over to parts advertisements, although on the first page a limited number of complete vehicles are advertised. This differentiates it from other trade journals, such as the The Garage & Motor Agent which tended to look at industry issues rather than sourcing parts. With the supply of brand new cars to the domestic market still very restricted, good examples of pre-war stock were still good sellers - someone looking for a usable family saloon may have been tempted by a 1934 Austin 12 in running order (£95), a 10hp Rover that had been converted into a tourer but needed work (£25), or a 1938/39 Wolseley 12 needing a re-spray and tidy-up for £125. Ex-military vehicles were commonplace in the early 1950s, and there were a few tempters amongst the commercial vehicles on offer this month .. how about a Dodge Command Car for £50, or a Fordson crew-coach (no price given)? Other American motor-vehicles included a 1934 Studebaker 26hp truck for £35, a 33hp 1937 Oldsmobile with Martin Walter Utility conversion, and a Graham 26hp saloon from 1937, with a damaged offside front, and "cheap to clear". The remainder of the magazine, which runs to 60 pages in all, is packed with text advertisements, and just a few larger box-type ads for the larger trade retailers. 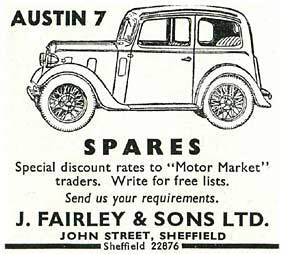 One such dealer in parts is J. Fairley & Sons Ltd, of John Street in Sheffield. They dealt specifically in Austin 7 spares, and their illustrated advertisement features a mid/late 1930s' Austin 7 Ruby to catch the buyer's eye. Special lists of parts were available, but only by writing to them. No speedy emails in those days! With many people running small sub-10hp cars on a shoestring after the war, the demand for cheap secondhand spares was significant, and there was much business to be had by breaking these little runabouts and selling the spares to either trade or private buyers. If you were interested in ex-WW2 army Jeeps, or parts for same, then a look at page 26 would have been essential reading. The page was headed by an advertisement for Wick Autos - The Jeep People, of Kingston-On-Thames. They had Jeeps for sale, and "every part in stock new or reconditioned". Not to be outdone, Motorcraft Garages, also in London, could also offer a similar range of parts, and also an "All Weather Drop-on Body", a handy option for a UK Jeep driver! All the usual makes and models make an appearance in this magazine's pages, but a close inspection also brings up some of the less-well-remembered motor manufacturers. For instance, how many examples of the Graham Paige remain in the UK, or the related Lammas Graham? Electric delivery vehicles were once a fairly common sight, and anyone working on a Lecar electric van in their garage, may well have been interested in the 1948 van being broken for parts at the Victoria Car Dismantling Depot in Nottingham. It'd be easy to highlight some of the cars mentioned in these old magazines, and say how cheap they appear to be compared to their respective values today, but given a time machine, who wouldn't be tempted to zip back a few decades and check out some of the more exotic fayre buried within these old ads? I'd possibly start my trip with a visit to G.A. Brooks (Motor Components) Ltd of Lingfield in Surrey, if only to gape in admiration at the Type 30 Bugatti that they had in for breaking - how could anyone have the heart to break such a car, even if it was in deplorable condition? A 1933 Delage 20.9hp at Clare's Motor Works in West Norwood would also be worth a nosey. Tucked away on page 14 is an advert for 3 ton Dodge truck parts, something I've been looking for constantly to aid the rebuild of mine, so I'd definitely make sure I popped over to Holmes & Younie Ltd in Sheffield to see what bits they had on the shelf. In many ways The Motor Market performed the same function as Auto Trader and Exchange & Mart went on to do, and today much of the trade that once occurred in magazines is now handled on the web, with sites like eBay, and even the old-car classifieds on this site, offering a similar service albeit with a much quicker turnaround, and potentially a greater number of viewers from both near and far.